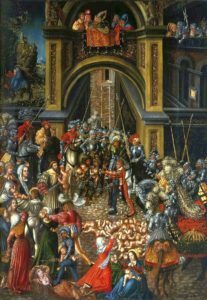 Holy Innocents is the often-overlooked feast day of the church calendar on December 28th that commemorates the slaughter of the infants in Bethlehem following the birth of Jesus. It hardly seems like the thing to celebrate right after the fanfare of Christmas, but then again, the church is known for doing things a little different. This day is generally familiar to only a few, including those vicars who have had the joy of preaching on it when it fell on the Sunday after Christmas. The historically sparse attendance on this Sunday isn’t the only reason so many are unfamiliar with this day. More and more, the rush to get to Christmas by skipping over the penitential season of Advent also means a rush to push Christmas out of the way on December 26th rather than observing it in its fullness until Epiphany. Increased secularization of Christmas and commercialism are often blamed for this, but perhaps it stems more from our desire to keep Jesus as the sweet little baby in the manger instead of the sword-bearing Son of Man (Matthew 10:34). Whatever the reason may be, Matthew’s gospel and the church calendar put us face-to-face with the bloody reality of Satan’s murderous agenda to destroy the Christ just three days after the peaceful manger scene unfolds on Christmas Day. Herod the Great (known for his cruelty and deep insecurity, which prompted the murders of his wife and sons) summons the wise men after hearing that the prophecy which foretells of the coming Messiah has been fulfilled. He says to them, “Go and search diligently for the child, and when you have found him, bring me word, that I too may come and worship him” (Matthew 2:8). His piety is suspect, and the wise men are quick to take heed when warned in a dream not to obey him. Herod’s attempts to win the favor of the Jewish people by expanding the temple, claiming to be Jewish, and marrying a Jewish princess were unsuccessful. 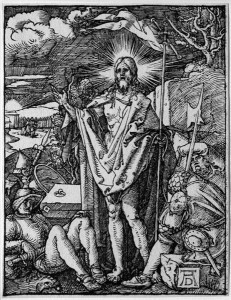 According to Luther, Herod feared that “if the new king is born, the Jews will rejoice, and will secret him for a while until he is grown up, and then will espouse his cause, put him on the throne and banish me.” Here Luther exposes the paranoia and true intention behind Herod’s false humility. 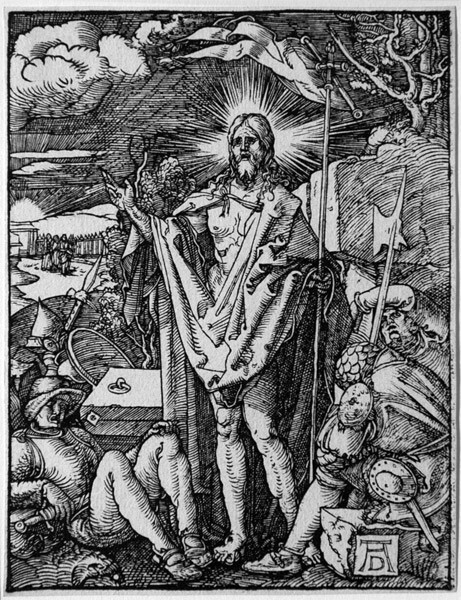 In Luther’s commentary of Matthew 2, he writes that the Scriptures and Christ have three kinds of disciples, of which Herod belongs to the second class: those who “searched the scriptures believing that it was the truth…and at once determines to set himself intentionally and directly against God’s Word and work.” Thus Luther was convinced that Herod “was already resolved in his heart to slay the innocent children” in order that he might secure his own kingdom. It goes to show that Herod and ultimately Satan will go to any lengths necessary, including the murder of innocent children, to oppose the work of God. At this point the reader of this story may ask how is it that we go from the infant Jesus in a manger to innocent babes being torn from their mother’s arms and turned into martyrs? Or perhaps some might ask what kind of god escapes to safety and leaves helpless children to a murderer’s rage? “The answer is not necessarily all that satisfying to our intellect,” states Rev. David Petersen, “But it is satisfying to faith.” Christ, like the church, is known for doing things differently. Satan knows this, which is why he lashes out with violence and bloodshed at the birth of this most holy Child. Even in His infancy, it is clear that Christ has come to thwart the evil plans of Satan and ultimately to defeat him, not in a show of great power and might, but in humility and weakness. According to Luther, “Humanly speaking, [Herod] acted wisely enough in his purpose of slaying Christ,” yet the seemingly weak and helpless infant still escapes to fulfill the prophecy, “Out of Egypt I called my son” (Matthew 2:15) illustrating just how futile earthly wisdom and wicked schemes are against the plans of the almighty God. And the Holy Innocents? By their deaths Jesus is secured safely in Egypt and the prophecy is fulfilled, “A voice was heard in Ramah, weeping and loud lamentation, Rachel weeping for her children; she refused to be comforted, because they are no more” (Matthew 2:18). The scandal of suffering for the sake of Christ is perhaps the most perplexing concept to the human intellect, yet as the poet John Keble wrote, their deaths ensured “That Thou [Christ] might’st live for them a sadder death to see.” Only in Christ does death equal victory and weakness equal strength. Long before Christ would say to his disciples, “Whoever loses his life for my sake will find it” (Matthew 10:39), these children were already resting secure in the arms of their Savior, the infant child Jesus. 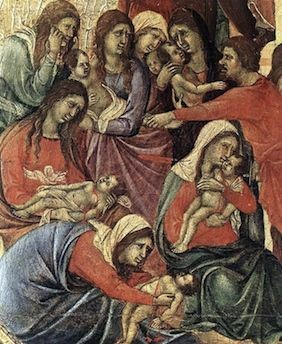 While the wisdom of God cannot be comprehended in this slaying of the Holy Innocents, what remains is the Child who lived, died, and rose for all in order that the promise of the Resurrection would belong to these Holy Martyrs and all who have been baptized into His name. Deaconess Betsy Karkan serves at Concordia University-Chicago.